Get ready to gulp down some delicious bingo treats – with none of the calories! 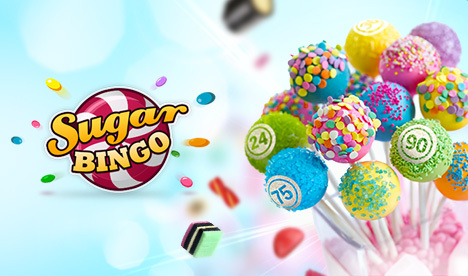 Sugar Bingo is one of the top UK bingo sites with the best online games, tasty bonuses, and delectable rewards! Join Sugar Bingo and discover a world filled with the sweetest bingo goodies! As soon as you join Sugar Bingo you’ll be showered with loads of bonus treats for an extra sweet start at the site! All new players can get a Sign up Bonus that consist of 77% Bingo Bonus Up to £77 + 7 Free Spins on Sugar Train on their first deposit of £10! Have a blast playing the best online bingo games with your extra bonus cash and win even more! Once you’re a funded Sugar Bingo player, you will continue to get pampered with exciting offers and bonuses every single day! As soon as you enter the lobby you’ll get loads of free coins which you collect and convert to playing cash for extra freebie fun! Sugar Bingo also loves to give their most loyal players extra special treats! Reach VIP status to get the most out of your bingo and gaming sessions. As a Sugar Bingo VIP you’ll get the most exclusive bonuses, special gifts, premium treats, and a personal customer support manager! Play some of the best 75 ball and 90 ball bingo games at Sugar Bingo for heaps of sugary fun! There are many live bingo rooms to choose from where you can play to win mind-blowing jackpots and prizes! You can really boost your wins when you play side games and bingo chat games during your bingo sessions. There are always exciting jackpot games happening every day, week, and month at sugarbingo.com. Play the MEGA jackpots which can reach a whopping £1,000,000 like Self Made Millionaire monthly bingo game! You can also enjoy fun 1p bingo like Lucky Penny, where it only costs a penny for a chance to win up to £5,000! Play over 200 of the top online games and choose from an unmatched selection of slots, scratch cards, roulette, blackjack, and more in Sugar Bingo’s casino games section! Spin to win classic slot games like Cleopatra and Rainbow Riches, or try your luck on the progressive slots where the jackpots can grow as big as £3,000,000! There are heaps of ways to get extra bonus goodies at Sugar Bingo! Use special bingo bonus codes to add extra funds to your account so you can play more top games. You can hear more about our delectable bonus offers on the site or via email, live chat, Facebook, & Twitter! Sugar Bingo runs on Dragonfish’s industry leading bingo software, so you can expect the highest quality gaming experience. The online slots and casino games are from the best games providers in the world such as Netent, Eyecon, Microgaming, WMS, and more. Whether you’re funding your account or withdrawing your winnings at Sugar Bingo, you can be sure that all your transactions are 100% safe and secure. Choose from a wide range of banking options such as PayPal, Paysafecard, and all major credit cards. Enjoy fast cashout, easy processing, and customer support for any questions you have. Go on a sweet bingo adventure on the go when you play Sugar Bingo on your mobile phone or tablet! You can access all your favourite bingo, slots, scratch cards, and casino games from the palm of your hand – 24/7! Visit Sugar Bingo’s mobile site from any iOS or Android device or get the free app for iOS at the App store! Get ready for some sweet bingo sessions and delicious bonus treats when you join Sugar Bingo today!